Heat oven to 400°F. On floured surface and using floured rolling pin, roll each pastry or pie crust to 12-inch round. Cut 6 (4-inch) rounds from each crust. Firmly press rounds in bottoms and up sides of 12 ungreased regular-size muffin cups. In small bowl, beat egg white and cumin with whisk until frothy. Generously brush mixture over insides of each pastry-lined cup. In 10-inch nonstick skillet, cook beef over medium-high heat 5 minutes. Add onion. Reduce heat to medium. Cook 3 minutes longer, stirring occasionally, until beef is thoroughly cooked and onion is tender; drain. Stir in taco seasoning mix, salsa and water. Cook over medium heat 5 minutes, stirring occasionally, until slightly thickened. 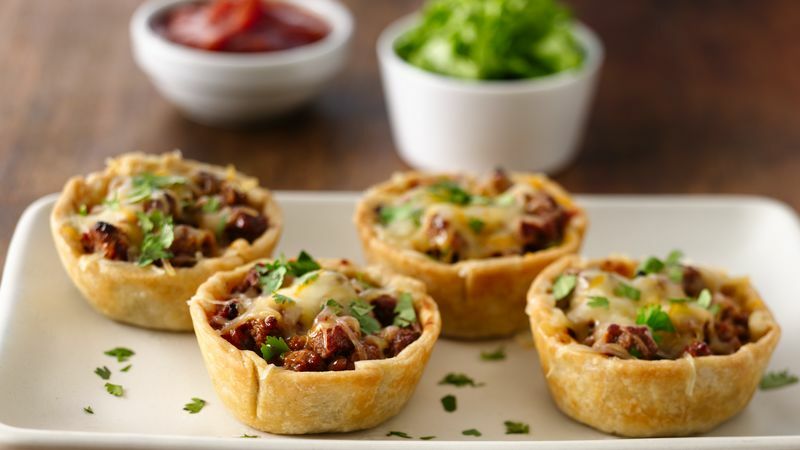 Spoon hot beef mixture evenly into muffin cups. Bake 30 to 35 minutes or until crust edges are golden brown. Sprinkle tops of pies with cheese. Bake 2 to 3 minutes longer or until cheese is melted. Let stand 5 minutes before serving. Sprinkle with cilantro. Serve with toppings of choice. Brushing the pastry with an egg white before adding the filling helps seal the crust, keeping the dough crisp and flaky. It’s particularly useful with a moist filling like this one.